Twelve of Mr. Humble's 120 chorus students provided the entertainment at the Dec. 4th Chamber of Commerce meeting at V.V.E.C. Mr. Humble stated this group included 10 past or present All-State Chorus members. 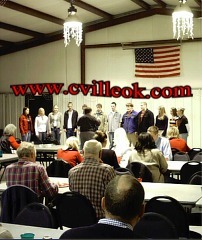 They sang a number of Christmas songs before a short business meeting and luncheon for the Chamber of Commerce. These and other chorus members will hold their annual Boar's Head Feast Dec. 13th at the High School at both 4pm and 7pm. 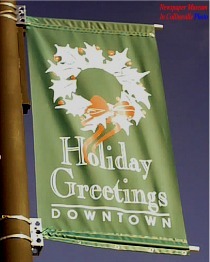 24 of these Chamber banners brighten the downtown area for the Christmas season.